I can’t count the number of lessons I have learned this year - 2014/15 Marked the first year I was a school principal, and as this year comes to a close there is something that sticks out above all the rest...my desire to be and do everything fell short. 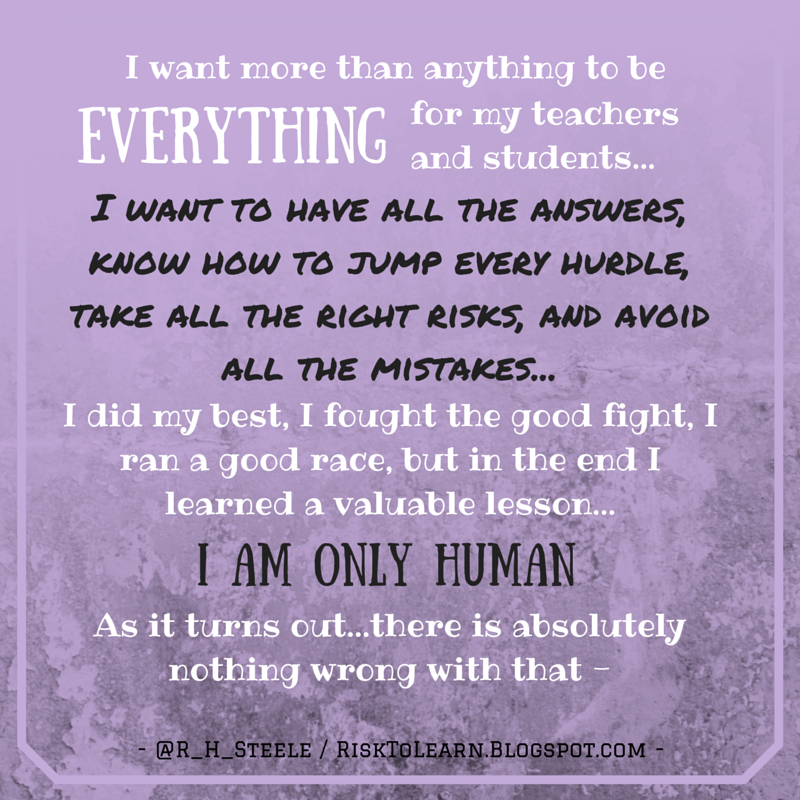 Here is what I know...I want more than anything to be everything for my teachers and students. 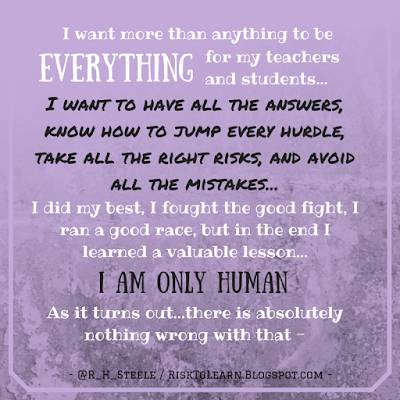 I want to have all the answers, know how to jump every hurdle, take all the right risks, and avoid all the mistakes...I did my best, I fought the good fight, I ran a good race, but in the end I learned a valuable lesson - I am only human. As it turns out...there is absolutely nothing wrong with that. The learning curve that exists for a new principal is like nothing I have experienced before. As a teacher I would carry the weight of my students’ success on my shoulders - in elementary it was all 26 or 27, in middle school that number jumped to over 100 students...but as a principal, well...I now carry the success of both the teachers and students, a combined 820 people - all of whom I give my all to every single day. In a previous blog post I shared how each day I work with teachers, students, and parents. Three separate groups, all with different needs, ideas, questions, and time needed. While I truly love working with all three parties, it’s not uncommon in one day to think about: Student success, teacher success, campus progress, changes coming, ideas to move forward, parental support, strength of the PTA, district and state testing, teacher needs, classroom management, student management, instructional coaching, professional learning, school budget, campus needs, building facilities, and so much more. Learning how to serve all three groups as a first year principal was quite a challenge...an amazing experience, but a challenge. The year ended with what-if questions like: What if I could have found a way to spend more time with the students? What if I modeled the use of technology for professional learning even more? What if I had more time set aside for meetings? What if I didn’t take that risk and tried something different instead? Of course, playing the game of “What If” only leaves doubt and angst - The truth is, while I may be only human, and lack any sort of true perfection - I was able to learn a ton, love my teachers unconditionally, support each teacher in his/her strive to be better, and offered encouragement and excitement each day. While I may not have reached every goal I set in one year, there is no doubt this year was a success - not only did I learn a ton, not only did each one of our students get an amazing year of learning under their belts, not only did I build relationships with the amazing teachers I work with each day, not only did I begin to form a bond with my wonderful community and parents...I was also blessed to see 820 amazing, wonderful, brilliant faces come to school and learn together. In the end - I look at it like this: One great year of learning down...and here is to praying for many more to come! Ryan I really enjoyed your open and honest reflections. I am certain that is what makes you the servant leader that you are. I hope to one day write a post like this. I am currently an AP, and know that my time will come. Like you wrote, it is very easy to dwell on what we did not do, when in all actuality there is so much that we do accomplish. Maybe because we spend so much time trying to get better and help our students get better, that we often don't realize how much growth we did make. Well done and thanks for inspiring and leading the way that you do. Well done, good and faithful Principal!